September 29, 2018 | 9:00 a.m. – 4:00 p.m. Thank you to all who joined us for the 2018 Day of the DozersTM event. We raised over $61,500 and everyone had a great time! Day of the DozersTM is a fun family event in Minnesota. The event provides an opportunity to educate families about the construction industry, while at the same time raising money for Children’s Hospitals & Clinics of Minnesota. At the event, children can ride inside a wide variety of construction vehicles alongside a friendly certified machine operator, play in sandpits, participate in other fun activities, and enjoy great food from some delicious local food trucks. This year, we’ve added MORE equipment, more gate entries, more vendors and more activities…all for one base rate of $10/adult or $20/child that will go to benefit the Children’s Hospitals & Clinics of Minnesota. Be sure to check out our Facebook Page for updates and our photo galleries for a visual idea of what to expect. 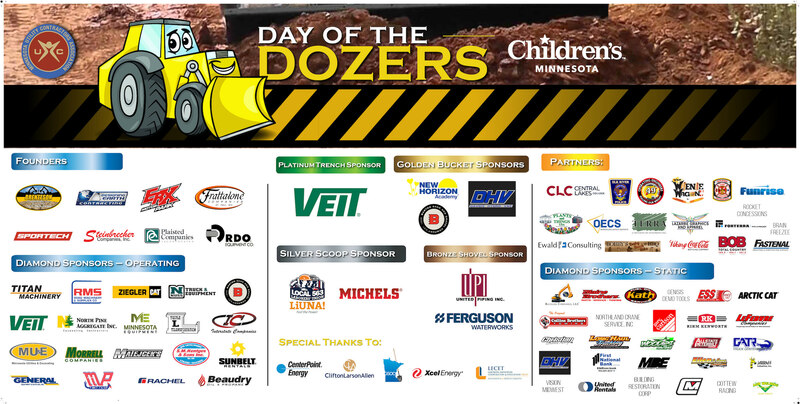 Day of the DozersTM is an event where children can experience the thrill of operating a piece of construction equipment with a trained and experienced operator while helping to raise funding for Children's Hospitals and Clinics of Minnesota. This years goal is $50,000 and this event would not be possible without volunteers, like yourself! All proceeds from this event benefit Children’s Hospital and Clinics of Minnesota. Sponsorship opportunities are available for this event as well. Interested in donating? Click here! In 2017 we raised over $47,845!